On a Keto diet and sick of eating regular eggs every morning? 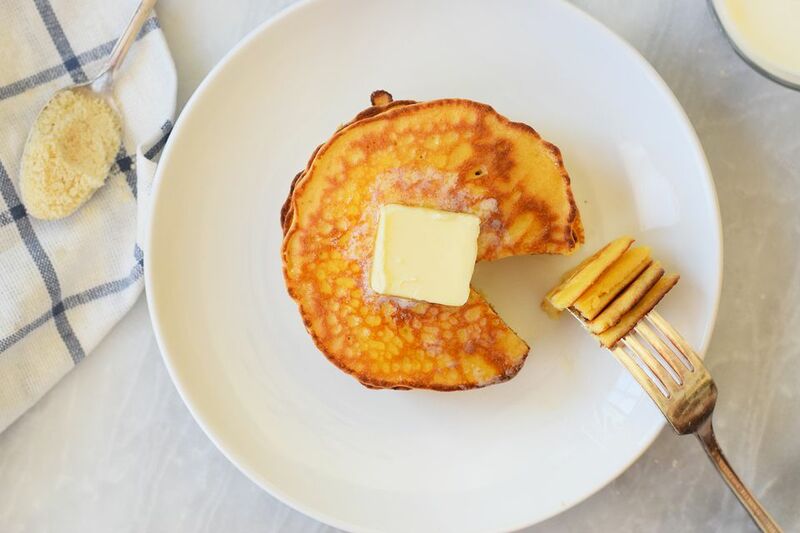 Check out these easy, and totally keto pancakes! They use almond flour, eggs, and cream cheese to achieve their classic pancake shape and taste. Baking powder technically isn't technically keto, so you can make your own at home if you want to make these babies a little fluffier. Or just leave it out, the texture is still great! We chose almond flour as the base of this recipe. It has great flavor and is an easy 1-1 substitution for regular flour. You can also try using other keto flours like coconut flour. You will want to use 2/3 cup if you are trying it out! Serve them alongside a few slices of bacon and some low-carb berries...and more eggs, of course! Add the softened cream cheese, almond flour, eggs and vanilla extract to a large bowl. Whisk them together until completely combined and smooth. A few lumps are okay. The batter will be thin. Heat a large cast-iron griddle or nonstick pan on medium-high heat. Add butter and swirl it around until it's melted. Then turn the heat down to medium-low. Add the pancake batter in the size you wish. The smaller, the better because the pancakes are delicate, harder to flip when large. Cook the pancakes for about a minute and then flip the pancakes over. Turn the heat down if you need to so that they do not burn. Cook time may vary depending on your stove top. Serve the pancakes with extra butter and dig in! The batter is delicate and will burn easily. Make sure to keep the heat on medium low. Just high enough to get a nice crust but without burning them! Making the pancakes smaller will make them easier to flip. You can make your own keto syrup if you are looking for a touch of sweetness. But they also taste great with a nice helping of butter! You can make your own almond flour if you want, just grind up some blanched almonds in your food processor until they become a super fine powder! You can change up the almond flour with other keto flours, like coconut flour or other keto flour blends. You may need to vary the measurements depending on the kind of flour you use. You can use coconut oil instead of butter.